Whether your child becomes the next big thing in music, or learns music just as a personal hobby, the importance of exposing kids to music education at a young age cannot be overlooked. Did you know that the benefits of music education span beyond just playing an instrument or singing? Music education not only helps kids learn the Do-Re-Mi’s but also enhances their learning abilities and skills that they will use later during their life. Many studies state that children exposed to music education have better cognitive and non-cognitive skills. Dr. Moreno, in order to study the benefits of music education conducted a study wherein a group of kids were given music training for 6 months. At the end of the training, the children improved in measures of verbal intelligence and attention. They also showed significant changes in their brains’ processing of items requiring a controlled response, or attention. How cool is that? If 6 month lessons impacted children so positively, just imagine what wonders a properly structured music curriculum would do a child’s fertile imaginative brain. As a Piano teacher, I feel the best age for a child to start learning formal music is around 5.5 to 6 years of age. At this age a child is mature enough to learn reading of notes and also sit and focus with a music teacher. If your child in younger than 5 then he can benefit from a more informal approach of music education like aural awareness, clapping and fun with percussion and sounds, and nursery rhymes. However if your child is older, don’t fret. My students as old as 12-15 also show increased enthusiasm to learn music and can someday go on to become professional musicians. Nevertheless, it’s never too late or early to pick up an instrument and enjoy the joy of learning music. The benefits of music education are vast. Let’s have a look into some of them. When a musician plays an instrument, his brain is a basket of fireworks. When a pianist is playing the piano, he uses his eyes to sight read the two lines of music. He uses his ears to listen to the notes being played and adjusts the playing accordingly. He uses both his hands in perfect coordination to play rhythms independent from each other on perfect time, while subdividing the beat. Piano is one of the few instruments which require use of all 10 fingers independently. He also uses his feet to play piano pedals, and touch to determine the force to strike keys to produce the desired sound. Playing any instrument stimulates different regions of the child’s brain simultaneously which otherwise wouldn’t be tapped. It’s a complete brain workout. Unlike brain games, music taps the emotional and the artistic aspect of human behaviour and makes long lasting changes to the brain. This has been proven by many brain scanning studies around the globe. Children when exposed to music at a young age learn to be creatively expressive. Children who have difficulty in expressing themselves otherwise might find playing an instrument and singing extremely fulfilling. Music can work as a huge stress buster for children. Children tend to calm down once engrossed in playing an instrument. 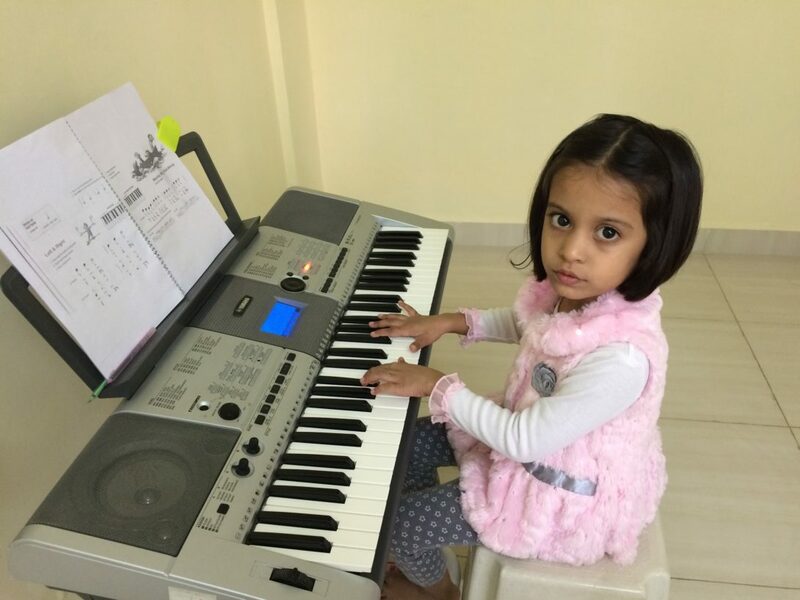 As a piano teacher, I have noticed that some students come for piano class in low spirits due to some problems at school/home but instantly forget about their unhappiness and cheer up 15 minutes into the class. This is one major benefit of music education that can be developed immensely by little kids. As a piano teacher, I see the initially kids struggle with left and right hand coordination. The right hand is required to play a particular set of notes at different subdivisions and the left hand is required to play another set of notes at different subdivisions while reading the notes from the sheet music, while also simultaneously playing the pedals with your legs. But persistence pays off. The kids who keep practising regularly eventually develop and master the coordination required. It isn’t easy, but it is worth it. These little Mozarts with highly developed motors skills will show great improvement in multitasking and learning later in life. The benefits of music education in developing a child’s verbal skills cannot be denied. Science shows that learning music requires the same parts of the brain required to learn a new language. Yes! Music is a whole new language that your child will enjoy to learn. Sound processing and clarity of thinking due to learning music result in most kids enjoying fluent verbal skills. A child cannot learn even the simplest of a musical piece without concentration, focus and the discipline to practice every day. By practising every day, the pieces get reinforced thereby improving memory. All this done every single day becomes a habit which is also seen in other aspects of the child’s life. Many people are unaware of the fact that music and maths go hand in hand and that reading, playing and counting of music requires understanding of fractions, clapping to the counts and dividing the notes to create beautiful music that we hear. When a child plays the little black dots seen in sheet music; his brain is counting the divisions, reading the pitch names and also keeping his rhythm and time in check. As per studies, playing music lights up the same part of the brain that is associated with spatial skills i.e. skills required for understanding Maths. When the child starts seeing the fruit of his hard work, he realizes that he is the captain of his life’s ship. As a musician, he will be performing in front of strangers, family and friends; thereby learning to be in the public eye and on stage and developing courage to face the real world. The appreciation received by the child for his performances will further boost his confidence and make him aim for even higher achievements. I started learning the piano when I was 7 years old and that’s the best thing my parents did to me. Not only do I perform in public and on my YouTube channel, but I also teach the piano to little kids and enjoy it thoroughly. I do see myself benefiting in other aspects of life due to being exposed to music at a very young age. I can definitely vouch for the benefits of music education mentioned above. What to expect when a child starts taking music lessons? If your child is enrolled for a professional music class, be patient with him. You will not see results immediately as they need to learn basics and familiarise themselves with the instrument. Also for the first few years, your child will be reluctant to practice as he doesn’t yet understand his instrument and music theory fully. Encourage your child and tell him that you love the songs he plays. Parental appreciation goes a long way towards creating proficient musicians. Every child has music in him that’s waiting to flow out. Be patient, be persistent and don’t give up.Those weekly trips to the music class, the money spent on teacher’s fees and musical instruments and the regular practice sessions with your reluctant kid will definitely fructify in the future. The greatest benefit of music education that surpasses all others is the endless joy and happiness felt when you hear your child play an instrument. Due to daily practice sessions, your home starts resonating music and it becomes an abode of love, happiness and beautiful melodies. y College London Music- Grade 8). Many of her students have appeared / are being trained to appear for Trinity College London Music Grade Exams. She also runs a YouTube channel (with the name of Elvira Gonsalves) which has uploads of Piano Covers played by her.